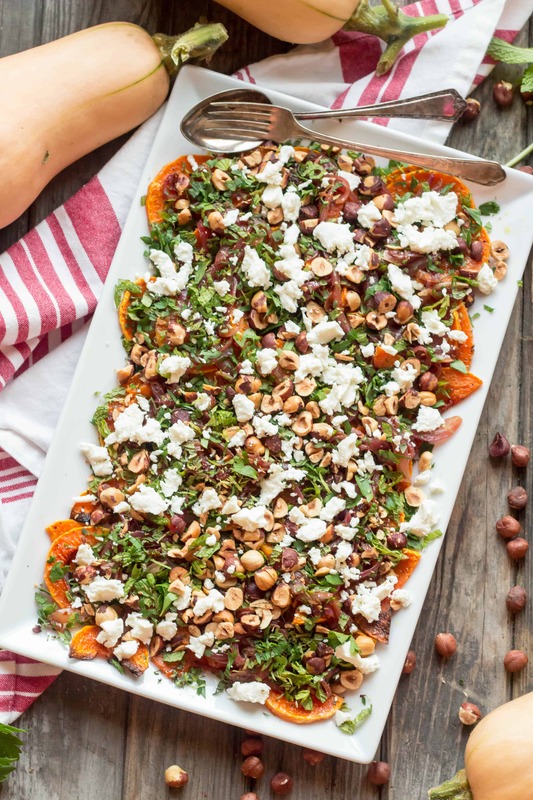 Sweet roasted butternut squash is set off by tangy lime juice, caramelized onions, creamy goat cheese, crunchy hazelnuts and a slew of fresh herbs. So good! You’re rolling your eyes right now. I know. I get it. No one feels sympathy for the girl who just got back from a sweet, sweet vacation abroad. But after 8 days of constant walking on cobblestones, non-stop wine/cheese/cured meat consumption, and a grueling travel day, my body is beat-up and begging for some rest. But the good thing is, while my body may have taken a beating, my mind was able to fully relax and recharge. That’s important. My body will recover, but my mind really needed that time off. My head is now full of ideas and inspiration to take me through this holiday season and into the new year. I’m pumped for the future. Are you?? The beautiful thing about a vacation full of eating and drinking in excess is that when it’s all said and done, I seriously crave exercise and healthy eating. My body is begging for vegetables and clean, home cooked foods. I actually made this recipe the week prior to our vacation, but now that we’re back home I can’t wait to make it again. Thanks to the abundance of butternut squash I found lurking in my garden yesterday, that should be no problem. Having a garden is THE BEST, you guys. But really, my point is that – garden aside – having a well-stocked pantry is so, so, so important. If you don’t cook very often, it’s tough to keep a pantry stocked with perishables like cheeses, apples, lemons, onions and winter squash. But most of these foods can last for weeks or even months at a time. So if you cook even just a few times a week, you’ll be amazed at what you can whip up with what you have on hand. After a good 10 days away from home, I was able to make a really nice meal yesterday with what we had in the house, no trip to the grocery store required. I cooked up some sweet potato gnocchi that I had stored in the freezer and tossed them with brown butter, grated parm, herbs and mustard greens from the garden. I served it with a variation of this salad, also made with kale, carrots, and beets from the garden. Still humble bragging over here (bear with me, I’m still jet-lagged). 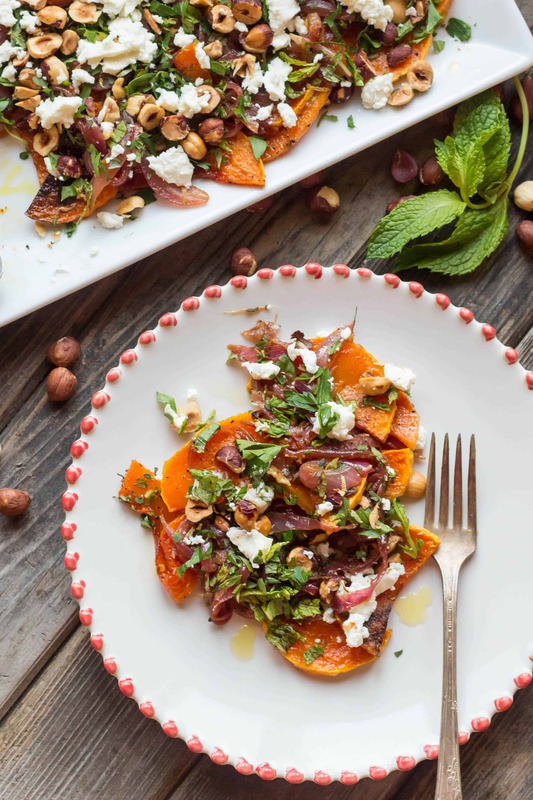 This butternut squash recipe is one that I stumbled upon last year in Bon Appetit and fell in love with it after the first time I made it. It was interesting and unique and had such a lovely variety of contrasting textures and flavors. 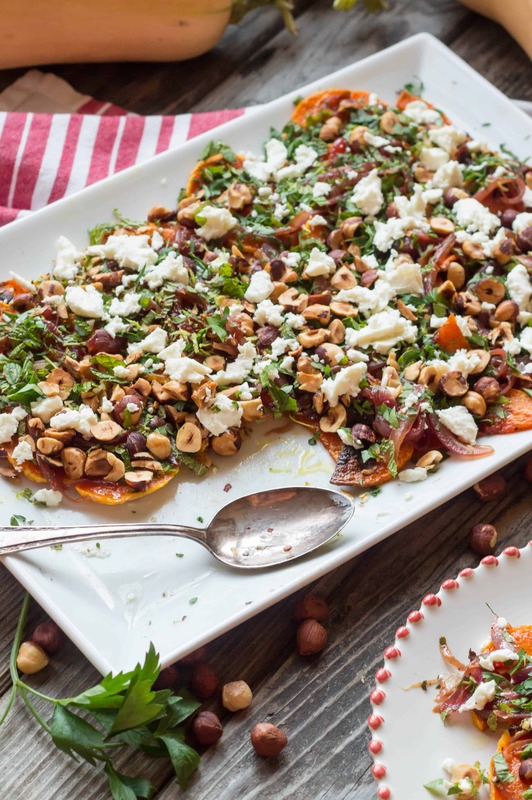 Sweet and caramelized roasted squash. Tangy and spicy sautéed onions spiked with lime and chile. 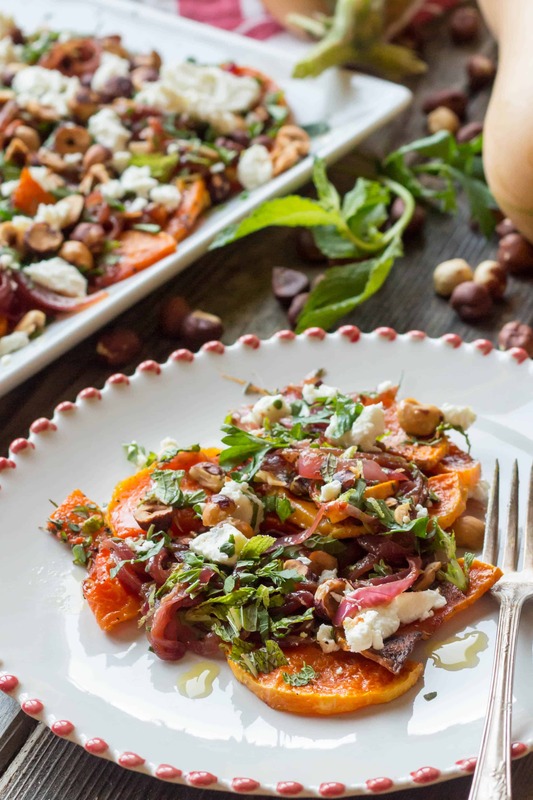 Crunchy toasted hazelnuts, creamy goat cheese and tons of fresh herbs. It’s a party in your mouth, and just so happens to be loaded with nutrition. Score! It’s filling enough to be a solid vegetarian main, and if you leave out the goat cheese, it’s totally vegan, too. But it really shines as a side, and would be pretty awesome to serve at this year’s Thanksgiving feast… Which, good God, is only a few weeks away, which means we’d better get to planning. If you buy all the ingredients for this recipe now, they’ll easily keep in your fridge/pantry until it’s time to roast the turkey. Okay, maybe not the herbs, but hey, that’s what the garden’s for. Adapted from Bon Appetit. 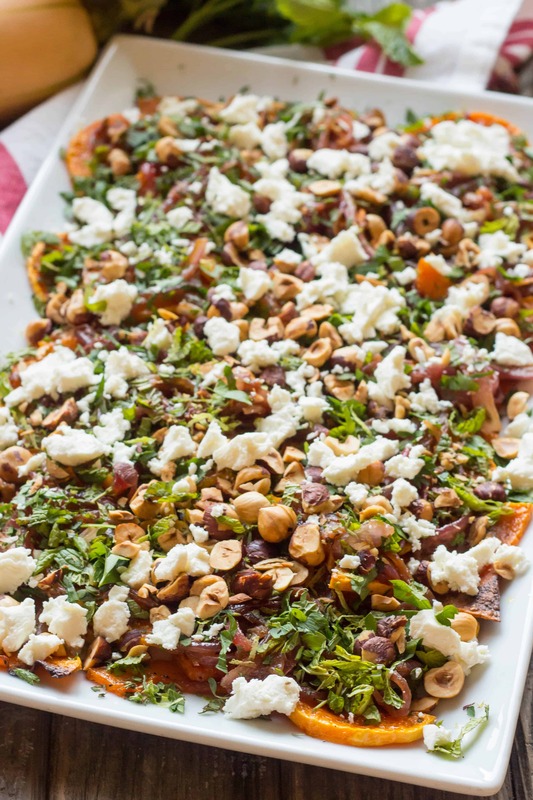 Sweet roasted butternut squash is set off by tangy lime juice, caramelized onions, creamy goat cheese, crunchy hazelnuts and a slew of fresh herbs. So good! Original recipe serves 8, but I cut it in half to serve 4. Recipe could easily be scaled up to serve a larger crowd. Preheat oven to 350 degrees. Place hazelnuts on a small baking sheet and toast until they’re golden brown and smell nutty, about 5-10 minutes. Allow them to cool down, then coarsely chop and set aside. Turn the oven up to 425 degrees. Line a sheet pan with parchment to prevent sticking (optional), then toss the squash with 2 tablespoons olive oil, salt, and pepper. Spread out into an even layer on the baking sheet and roast, undisturbed, until tender and caramelized, about 20 minutes. Transfer squash to a serving platter. 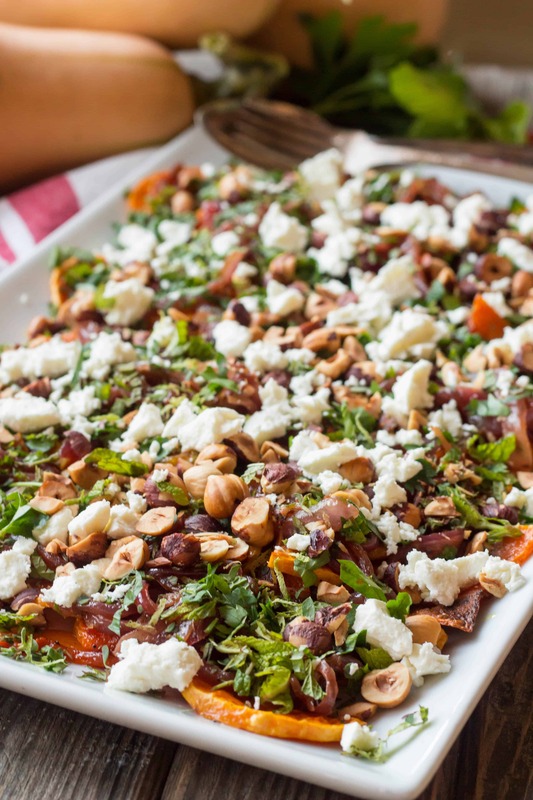 Top with spicy onions, crumbled goat cheese, fresh herbs and toasted hazelnuts. Drizzle with the remaining tablespoon of olive oil and serve. This recipe is great served warm, room temperature or cold. 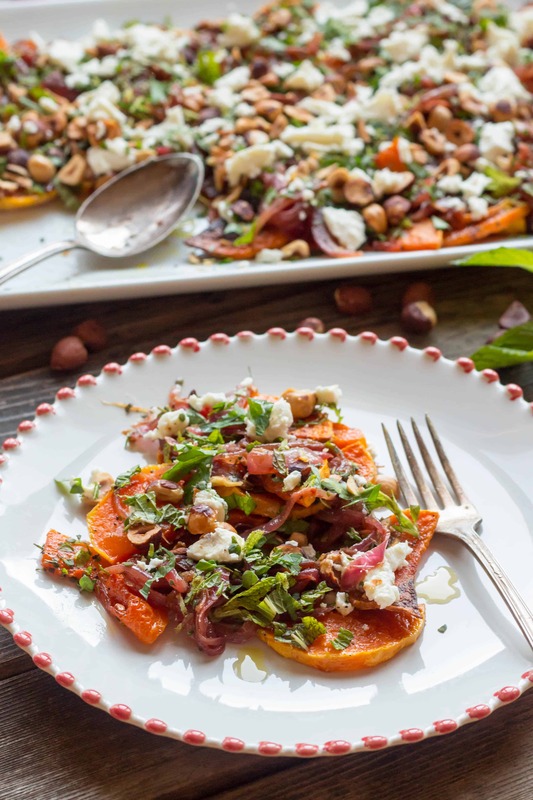 That butternut squash from your garden is amazing! I saved the seeds, so we’ll see what they make of a Florida winter. Ugh, Thanksgiving. I’m hoping you’ll inspire me. 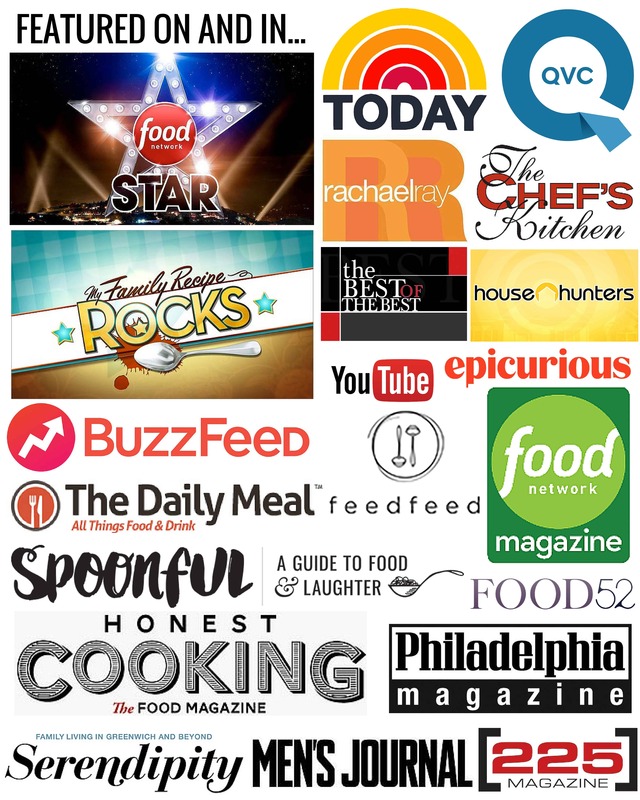 So happy to have connected here via our love of food. Spain sounds wonderful and one place we have yet to hit up. I wish I had a garden but the two boys, our dogs Olive rand Kodi are basically the entire thing last attempt so no go. This is a dish that’s right up my alley in flavors and looks fantastic. Thanks Coley! Thanks, Keith!! It’s really, really tasty. Perfect for Thanksgiving! !